Team Tennant: Happy 11 Months, Luke! Luke turned 11 months old on Monday! What joy this little one brings to our family. As we prepare for baby #2 to arrive around Thanksgiving (and we will find out this Friday whether Luke will have a brother or a sister! ), we are soaking up as much one-on-one time with Luke as we can. Here are pictures of some of the events of last month. We recently traveled with Daddy while he worked some shifts in northern KY. This little guy knew how to have fun- even in a call room! While in northern KY, we went to the Creation Museum and visited their petting zoo. Let's just say the donkey liked Luke a little bit more than the goats did, but the feelings were mutual. We also traveled to Memphis a couple of weeks ago, where we spent some quality time with Mama T, Pap, Uncle Adam, and Aunt Sharon. Here's Luke admiring Uncle Adam's new ride. Pap soaked up some quality time with this little guy! 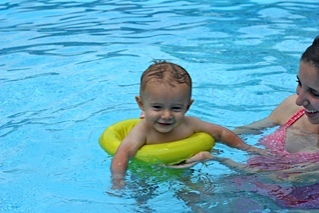 And he had to prove to Mama T and Aunt Sharon what a water bug he is. This little boy loves bath time! And Luke especially loves his Aunt Sharon! One of the highlights of our trip: getting to visit with the "Grandpa Rick" and "Grandma Debra" and "Aunt Julie" and swimming in their pool! He swam for a few hours, and given the opportunity, he would have stayed in that pool all day! 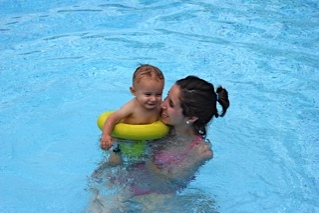 This fearless water baby will be in swim lessons asap! We are true Tennants! Here is Luke eating some home-grown zucchini from our backyard (thanks to Aunt Kathleen's green thumb during her last visit!). Time has flown, little Luke. You are a delightful, adorable, irresistible blessing to us. We love you more than we ever thought was possible, and the only One who deserves credit for that is the One who made you and who sustains your every breath. May we, your parents, fix our eyes on Jesus as we rear you, and may you live your life for His glory, which is your greatest joy. Happy 11 months, Luke!